Take some time out and enter an oasis of relaxation and wellness right on New York Avenue in Huntington. The owner of Phountain Health has lost family members to various diseases and is on a mission to bring holistic, sustainable health and beauty solutions to our community. $149 for 3 Detox Contour Body Wraps - With a 15 Minute Infrared Sauna Session ($225 Value) - PLUS All New Clients Will Receive an Alkaline Demonstration (Please call and schedule appointments). 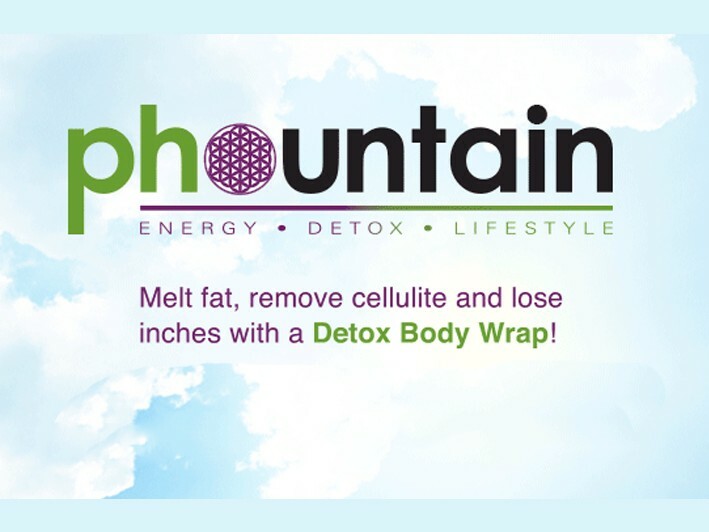 What is the Detox Body Wrap? Our Detox Body Wrap Treatments aid in body contouring, cellulite reduction, inch loss, skin tightening as well as a detoxification for your fat cells. Our detox formula is massaged onto the arms, abdomen and thighs. The technician then creates a tight suit using plastic wrap to encourage the cream to absorb into the pours, allowing it to work its magic! Once the wrap is completed, you will be able to lounge in a cozy, peaceful room where you can meditate, read, nap or however you choose to relax. We recommend wearing loose fitting clothing. It is necessary to wear a bra and underwear. If you desire cellulite reduction on your buttocks, we suggest wearing a thong. Do not be concerned, the cream does not stain your clothes. Drink plenty of water! We advise you to drink at least half a gallon of water the day before, during and after treatment. Exercise after treatment is recommended. Avoid showering at least five hours after treatment. Avoid shaving at least 12 hours before treatment. Can I boost my treatment? Of course! Our infrared sauna prepares the body for ultimate results by opening up the pours and accelerating circulation. The body vibration therapy also influences circulation while stimulating your cells to begin the detoxification process even before the wrap treatment. Packages are available including additional services. Call for more information. • Drink plenty of water! We advise you to drink at least half a gallon of water the day before treatment.